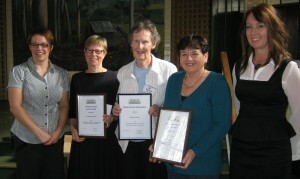 On Saturday May 17th Gippsland Historians Dr Meredith Fletcher and Lyn Skillern were presented with awards for their outstanding contribution to the recording and publishing of the history of Gippsland. Marion Holding of Lakes Entrance was also given a welldeserved award for her work in preserving and promoting the history of the Lakes Entrance area. Meredith Fletcher was the coordinator of the Centre for Gippsland Studies for many years and has written a number of books and articles on a variety of subjects including a biography of noted Gippsland botanist and gardener Jean Galbraith. Lyn Skillern is our secretary and the secretary of the South Gippsland Historical Network. She has written extensively about the history of secondary education, the impact of war on the local area and the pioneering days of South Gippsland.